Material: High quality stainless steel. it is lead free and nickel free,hypoallergenic, it doesn't rust, change color or tarnish. Size: Inner Diameter: 2.4 inches (60mm); Width:0.27 inches(7mm); Opening: 1.3 inches(33mm). TIPS:manual measuring permissible error. A classy way to wear our most-useful hair accessory! Simply place the bracelet on your wrist and wrap your hair tie around the groove. When you need the hair band, it is easily removed and a simple, elegant bracelet remains. No more large creases on your wrists from elastic bands. 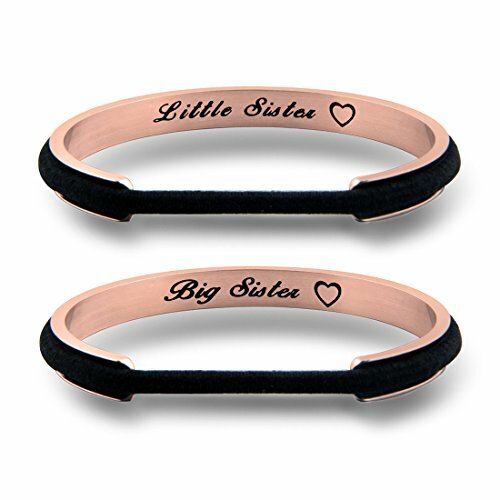 Perfect gift for any girl who can never find a hair tie and no more grooves in your wrist! Perfect for any occasion! They will come beautifully packaged, and ready for gift giving.